Back in 2008, staff at the Archives began working with lead developer Artefactual Systems Inc to build a prototype of an open-source, standards-based system to preserve and provide access to digital records. We needed a system with the same attention to reliability, authenticity and accessibility that we use to preserve our traditional paper, film and photographic holdings. This prototype became Archivematica, an open-source digital preservation system. We have been working with Artefactual to develop it over the past three years as part of our Digital Archives project. Our new system offers a number of ways to search for records, including keyword searching, browsing and navigating. The Search box and the Advanced search on the right allow you to search for phrases and keywords. The links in the Browse section on the left allow you to view lists of descriptions, creators, subjects and places as well as thumbnail versions of digital objects. The URL of your search (circled below) is a permalink. Unlike in our old system, it will not expire. If you look in the Fonds section in the left sidebar, you can see this description represents an item in Subseries 3 of Series 6 of the Major Matthews collection, AM54. The links in this section will take you to related descriptions. (Tip: always open links in a new tab in your browser so you don’t lose track of your original search results). The new system allows us to show the relationships between records and their creators. There’s an Authority Record for each creator and it is linked to the records they created. In our old system, we could only attach a single administrative history or biographical sketch to a body of records. Now we can attach multiple creators to a single body of records and show their responsibility for those records over time. 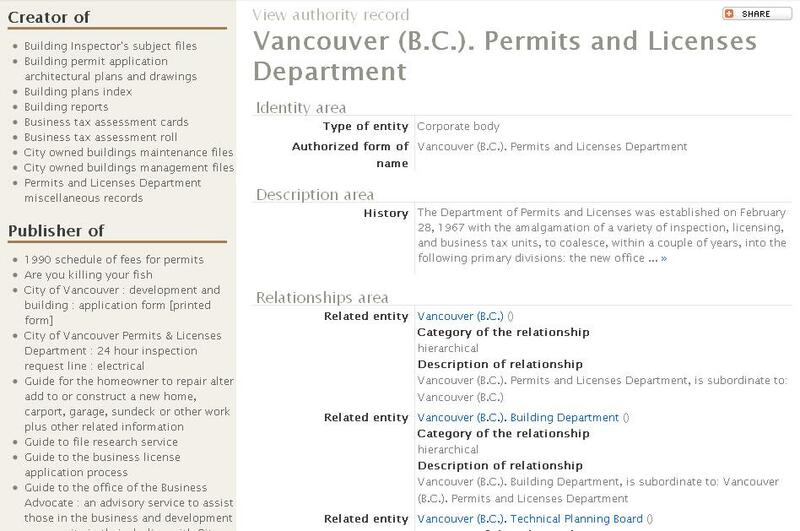 This is really useful when looking at records created by the City of Vancouver. This is the Authority Record for the City’s Permits and Licenses Department. The Authority Record gives the creator’s name (in the Identity area), a brief history or biography (in the Description area), and lists related creators (in the Relationships area). The latter allows us to show relationships between creators, such as the different names of organizations responsible for records over time. The left sidebar lists of groups of records the creator made or received, as well as individual records the creator has published. Long-time users of the Archives will be familiar with our old way of identifying private-sector records collections or fonds by Add MSS, or “Additional Manuscript” number. Add MSS has been shortened to AM. The concept of “Reference code” is also new. In the example above, the item’s reference code is AM54-S4-3-: PAN N216. This reference code is made up of codes from higher levels of description (everything before the colon) and an item-level code (everything after the colon). The reference code is what you should now use for citation purposes and for ordering reproductions of items. Our old City government records series numbers are still in use, but are now part of the Reference Code. 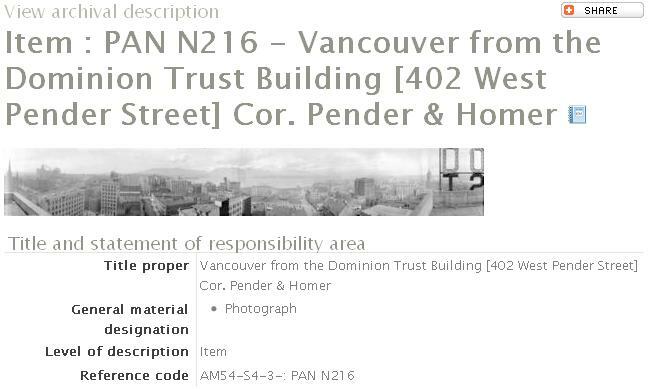 As a result, the Reference Code for an item in one of the City fonds could look like this: COV-S632-: CVA 789-27. 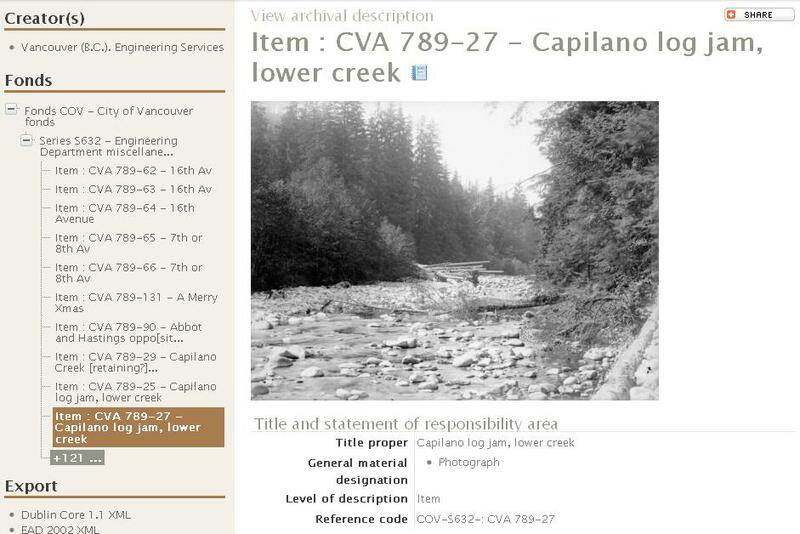 This code identifies a photograph in Series 632 of the City of Vancouver fonds. 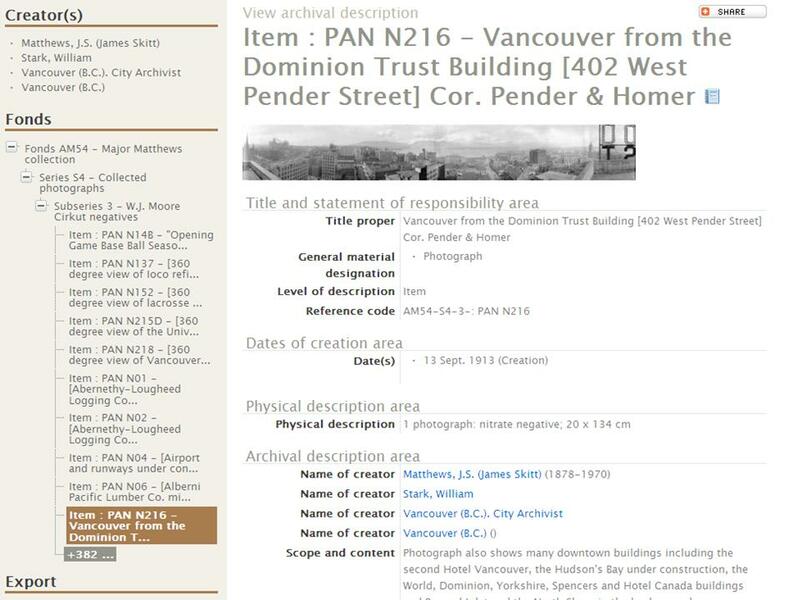 The creator is listed as the Vancouver (B.C.) Engineering Services. The new system offers higher-resolution digital objects. For photographs and other graphic material, click on the image in the Full Description to produce a high-resolution jpg. Click on the image again to produce a jpg with the same resolution as the original digital object. If the item you found is a moving image, click on the Download Movie link below the streaming version in a Full Description to view the video in the mp4 format in the same resolution as the original. If a higher level of description, such as series or fonds, contains digital objects, thumbnails will appear in the Cover Flow viewer in the left sidebar of a Full Description. 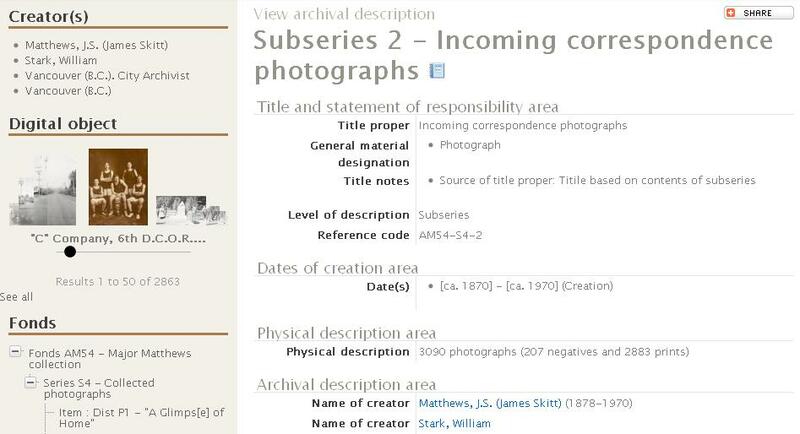 In the example below, the images in AM54’s Incoming correspondence photographs subseries appear and can be browsed using the cover flow viewer’s slider. The “See all” link below the viewer loads all the related images, but note that if there are thousands of images in the set, your browser may time out. Although we were able to combine data from many of our existing systems into this new one, the data in our Council Minutes Index could not be imported. You can download it here as an Excel spreadsheet file (19 MB). The .xls file is also available on the kiosk computers in our Reading Room. We are one of many organizations contributing to the development of the ICA-AtoM software; others include Library and Archives Canada, the World Bank, Archives de France, the Canadian Council of Archives, the United Arab Emirates, and UNESCO. The approach taken by lead developer Artefactual Systems is that of a rapid development cycle. Changes happen quickly, with new releases every year. We hope you find much to like in our new system, and we look forward to your feedback. Some of the “Dublin Core” files are non-compliant XML documents. Consider the file for Item “AM54-S4-3-: PAN N38”. The culprit is the “&” character in the title. Outside of a CDATA section, it’s seen as a syntax marker and not as a shorthand for “and”. For compliance, it needs to be replaced by the predefined character entity “&”. Some XML parsers, like the one used by Opera browser, are not forgiving and reject the whole document. Good luck with the re-tooling, refactoring, etc. Thanks for this, Yves. We’ll pass the comment on to the ICA-AtoM developers and we’ll also watch for this in our descriptions and fix the symbol where we can. William, do you mean the entry for the “Harry D Bohart Collection”? If so, we’d be including Westondorp as part of “Palm Dairies” as a creator. Our authority record for Palm Dairies (http://searcharchives.vancouver.ca/palm-dairies-limited;isaar) lists Westondorp as manager from the late 1970s on. Do you happen to know if he was with the company beyond 1981? The picture does not match the description? Thanks very much for pointing that out. We’ll get it fixed. Would you like to know more about the photo or about the Lipsett collection? “19269” doesn’t look like one of our photo identifiers, so it is likely not one of ours. We do have a couple of files of documents regarding the Lipsett collection, though (http://searcharchives.vancouver.ca/lipsett-edward-lipsett-collection and http://searcharchives.vancouver.ca/lipsett-collection-2) and the Museum of Vancouver now houses the collection itself (it used to be housed at the Pacific National Exhibition). The location of this photo is incorrect. The name on the station is “Pacific”. This is on the Grand Trunk Pacific railway near Prince Rupert BC. It is not in Hope BC. Thank you for pointing this out. We’ll update our description.